[Blind Gossip] Most fake celebrity relationships end smoothly. This is especially true if there is a “professional services contract” in place. There are terms and conditions that make it a contractual job like any other job and the parties are legally obligated to stick to the contract. This young male singer made a mistake! He did not have a contract with this young female model with the famous last name. That does explain why the relationship was so uneven. Once day they were claiming it was a romance and the next they were claiming to be “just friends.” Then she kept pursuing that other male singer in the middle of all of it. Messy and unprofessional and embarrassing to the first male singer. The lack of a contract also explains why the ending was not cool. She just deleted the first male singer from her social media accounts! That’s a move typically reserved for either fake relationships that are in the middle of a contract (to generate rumors) or for real relationships that end badly. It’s much too harsh a move for a fake relationship that should have ended gracefully. [Optional] Where will any of these three people be in five years? Haiely Baldwin’s relationship with Shawn Mendes was fake… but it did serve its purpose! It kept Baldwin in the headlines dating someone famous while she continued to pursue Justin Bieber behind the scenes. It worked, too. Baldwin and Bieber got back together, and in just a matter of weeks, they were engaged! Unfortunately, Mendes got the short end of the stick here. With no contract, there was no compulsion for Baldwin to behave herself. She dumped Mendes – hard – from her social media accounts. That was a bit embarrassing for him. After all, Mendes is the bigger celebrity, and smaller celebrities aren’t supposed to dump bigger celebrities. Even if the relationship wasn’t real in the first place. Now Shawn Mendes is talking about how he feels compelled to date women to prove that he’s not gay. Shawn Mendes is opening up about insecurities surrounding his sexuality being questioned. 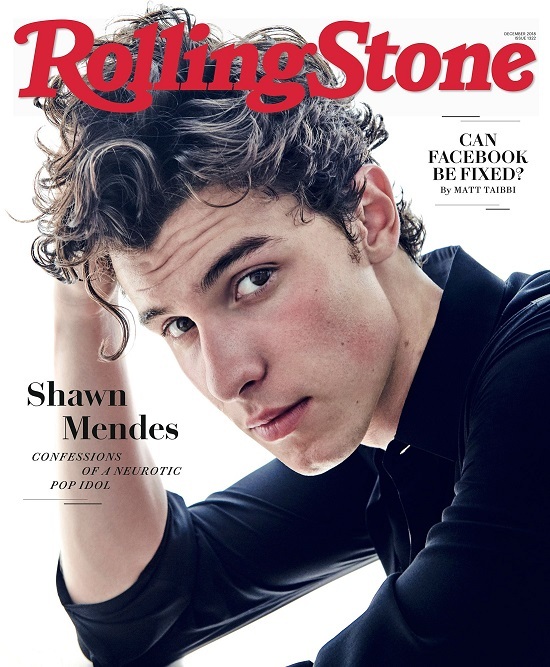 In a December cover story for Rolling Stone, the 20-year-old Canadian heartthrob reveals the gossip surrounding his personal life causes him a lot of stress and anxiety – so much that he feels pressured to dispel rumors. Whatever, Shawn. Next time, when you want to fake date to prove you are not gay, try to pick someone who won’t use you to score another pop star. Oh, and get a contract. Live and learn! Congratulations to Kitteekat for being first with the correct answer! Meow! Mendes isn’t fooling ANYONE, he’s gayer than Christmas. Optional: hopefully in the history books and not still making headlines! Hailey Baldwin, Shawn Mendes and Justin Bieber. Optional: Shawn Mendes — he will be still famous and out. He’s super talented but not good at being fake. Justin will still be a major superstar, not sure about Shawn but I hope Hailey will have her life together by then. She was really supposed to be on the level of Bella, Gigi and Kendall but she seems more concerned with being someone’s girlfriend instead focusing on her modeling career. First singer is Shawn Mendes and the second is Justin Bieber. Shawn: Grand Marshall of the 2023 Toronto Pride Parade. WAS THIS A GIMME? Too Easy!!! [Optional] Where will any of these three people be in five years? Sitting at home with their cats, hopefully! Optional: Hailey will be on some reality show, Mendez will still be pretending to adore love-sick female teens and Beiber will still be singing his toenail-voiced “songs” to pre-teens. [Optional] Where will any of these three people be in five years? Bieber and Mendes will probably keep making music but who knows if they’ll be as famous as now. Baldwin… What does she even do now anyway? Shawn needs to just sit down and come out as bi. JC, everyone knows he’s gay, even me and I’m not a fan. Shawn will be out of the closet within the next year or so. In 5 years we’ll be reading that Biebs is suing Hillsong to retrieve millions. Hailey is still bearding and Shawn’s career is peaking. It’s makes you wonder what Hailey does for an actual living. I don’t know. Hell, 5 years ago I thought Biebs would be over. Haley Baldwin, Shawn Mendes and Justin Bieber. I don’t know the order because Haley is always sniffing around Bieber, so Shawn was the new guy to me. Anyway, this blind is about these three. In five years Shawn probably won’t be remembered. Haley and Selena will still be on again and off again with Bieber. That is unless his religious journey takes him to the Duggar’s church and he marries the pretty one who’s still single, in which case he might have 4-5 kids in five years. Shawn Mendes and Hailey Baldwin. I guess the other dude was Justin Bieber? But Shawn is talented and I think he’ll still be doing well in 5 years, while IDK even know Hailey is now. [Optional] Where will any of these three people be in five years? My predictions- Hailey Baldwin rehab multiple times, Beiber back to Canada if we get lucky. Mendes flamed out as a singer.